This product is EXACTLY the same composition as Revolution. 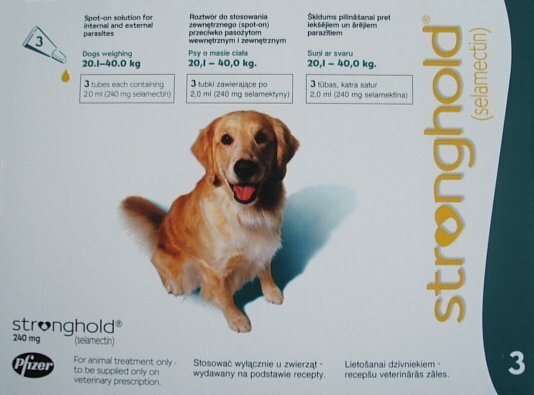 STRONGHOLD® for Dogs is a topical once a month parasiticide which provides treatment against external and internal parasites including, heartworm, ear mites, hookworm and roundworm. STRONGHOLD® is used once a month and is convenient and easy to apply. Kills adult fleas, flea eggs and flea larvae in the environment. 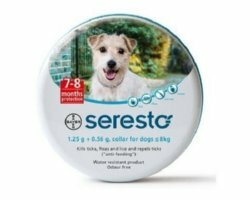 Treats, controls and prevents flea infestations. For the treatment of ear mites (Otodectes Cynotis). For the treatment of adult roundworms (Toxocara Cati) and adult intestinal hookworms (Ancylostoma Tubaeforme). For the treatment of biting lice infestations caused by Felicola Subrostratus. Please note we sell the UK version of the products listed below. REVOLUTION® has been approved for sale in Australia by the APVMA. STRONGHOLD® has been approved for sale in the UK by the VMD. The EPA has approved the U.S.A. equivalent of these product for sale. All of these products (the Australian, U.S.A. and UK presentations) contain the same active ingredient, Selamectin. However, the products sold by us are sold in UK packaging, which has not been approved for sale in the U.S.A. As a consequence, the UK packaging does not have EPA approval and the sale and purchase of products in the UK packaging may be illegal in the U.S.A. IMPORTANT NOTE: If swallowed call a poison control center or doctor immediately for treatment advice. For hazards to domestic animals the 24-hour assistance line within the U.S.A. is 1-800-660-1842.